Philadelphia has a long and rich brewing tradition going back 300 years and is rightly proud of their beer heritage. 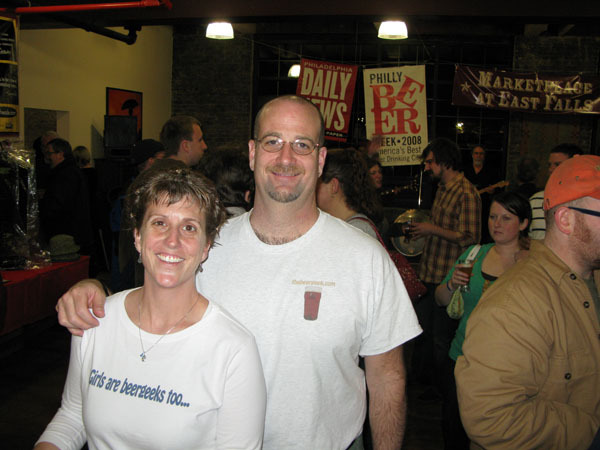 And that pride showed in the enthusiasm and level of participation for the first ever Philly Beer Week. It was truly exceptional for a first time event. Over 100 events were scheduled for the ‘week’ and while we were here for only the beginning, we managed to pack in quite a bit of beer drinking. Our schedule was pretty packed for Friday and Saturday so rather than going over it beer by beer, here are the highlights of the two days. Our Friday began with a bit of sightseeing. Richard Wagner, a local beer historian, took us on a walk around the old city, not only showing us famous landmarks such as the Liberty Bell, but also the sites of historic taverns and breweries that long have disappeared from the landscape of the city. 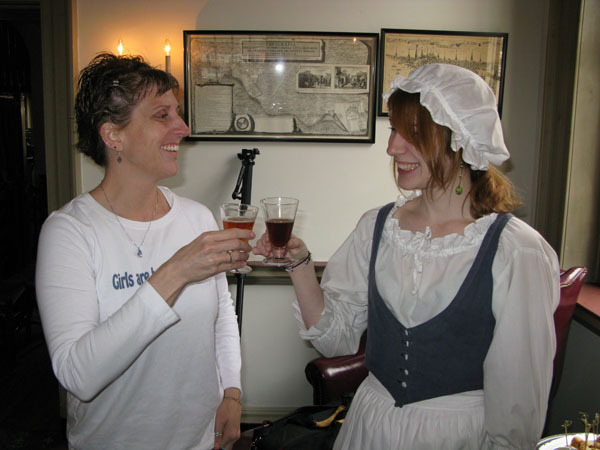 The highlight of the our tour was a visit to City Tavern, a historic recreation of a 18th century colonial tavern that was frequented by many a founding father. Poor Richard’s Tavern Spruce – a spruce beer based on Ben Franklin’s recipe. George Washington Tavern Porter – a porter that uses molasses and is a recipe Washington used himself. 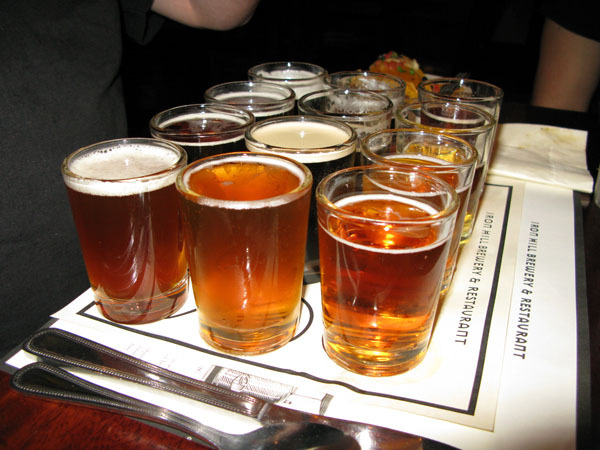 Thomas Jefferson Tavern Ale – a golden ale based on Thomas Jefferson’s recipe. Kudos to Yards and City Tavern for researching these recipes and bringing back a piece of brewing history. 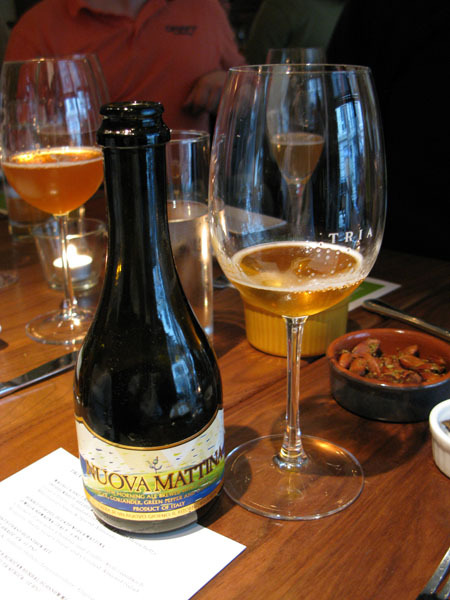 Lunch was four-course meal paired with beer at Tria, Philadelphia’s wine, cheese and beer cafe. I mention Tria not just because of the amazing beer-food pairings but also to plug their ‘fermentation school’ where some of the best beer minds in the world come and share their passion. We were able to visit two breweries on Friday; Triumph Brewery, a new addition to the Philly brewpub scene and the first brewpub that we have been to with coed bathrooms. Odd facilities aside, I was excited that they had a kellerbier that I enjoyed. I don’t think I have ever seen a kellerbier made in the States. Philadelphia Brewing, a brewery so new that they had just shipped their first product two days prior, is the new venture of former owners of Yards. The brewery building, built in 1885, was part of the Weisbrod & Hess Oriental Brewing Company. When they finish the remodeling, the brewery tasting room is going to be something to behold. Friday evening was the first event for Philly Beer Week; a beer tasting with 20 regional breweries at the Marketplace at East Falls. Here, the mayor of Philadelphia, Michael Nutter tapped the official first keg; Extra Special Ale from Yards. It was good to see a big city mayor so supportive of the beer community. The only problem was that this was the big chance to try a lot of the regional beers but because of our busy schedule, I was only able to try a small fraction of the beers available. The highlights were Hoptimus Prime from Legacy, ESA from Yards and the porter from General Lafayette Inn and Brewery. 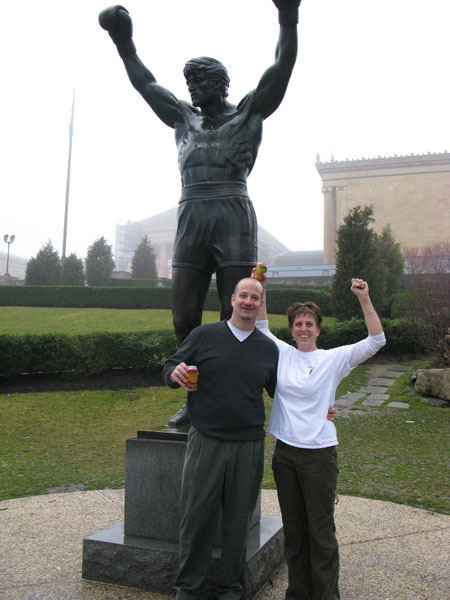 The plans for Saturday included visiting two brewpubs in the Philadelphia suburbs, but the first task Saturday morning was to go to the Philadelphia Art Museum – not for the Frida Kahlo exhibit – rather to draw some strength and inspiration from the Rocky statue. We wanted to run up the stairs too but unfortunately, it really started to rain. 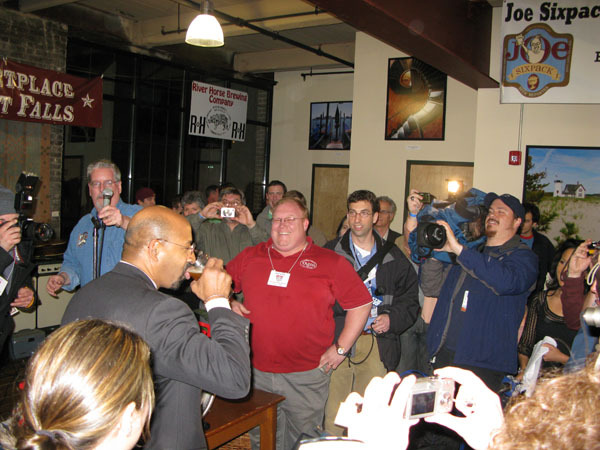 The first brewery was Sly Fox Brewery and Eatery in Royersford, one of the breweries in the canning movement. But there is more to Sly Fox than the fact that they can their beer. The Sly Fox lineup includes a GABF gold medal winning Pils. I also enjoyed the Helles, IPA, and their dry Irish Stout. Sly Fox and Yards were probably my two favorite breweries on the trip. After Sly Fox, it was back on the bus to the short ride to Phoenixville and to Iron Hill Brewery. Iron Hill had an impressive spread of 12 beers. My highlight list for Iron Hill would have to include Pig Iron Porter, Ironbound Ale and the ESB. Though I am not going to get into the “best beer-drinking city” debate, Philadelphia definitely deserves to be mentioned with cities such as Portland, Boston, San Francisco, Seattle, and [insert your beer drinking city here so I don’t piss anyone off]. Their beer culture ranks up with the best and is worthy of your beer travel dollar. 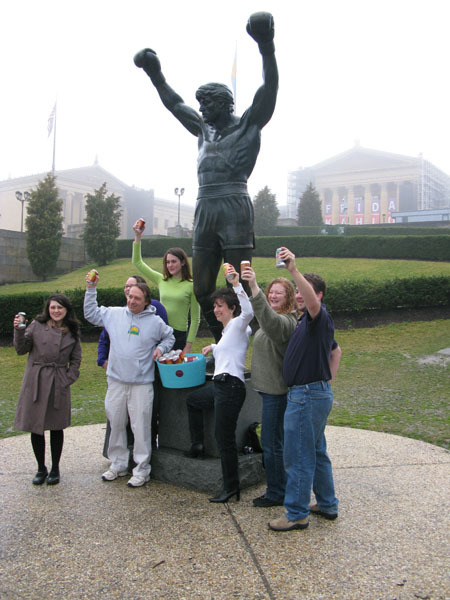 I really have to give credit to the Greater Philadelphia Tourism Marketing Corporation for seeing that there is a whole community of beer travelers they could tap into. Many cities take us for granted and Philadelphia should be commended. To make your Philly plans go to gophila.com. I speak for both Merideth and myself in thanking Cara and Morgan for putting on a great tour. And thanks to all the Philly beer people who took time out of their busy schedules to entertain us. Final thanks go out to our little group… Rick, Tracey, Dan, Kevin, Jay, Lisa, Mark and Fausto. It was fun hanging out with old friends and new ones alike. To see all the images from the trip, click here. We should have the video up in a few weeks.